Offers custom made mailboxes, lawn ornaments & garden decor. Mid and high power kits. Order by phone, fax, mail, or email. Retail model railroad equipment. Order by phone, fax, mail, or email. Publishes on the Montauk project and other time travel conspiracies. Ordering by mail, phone or email. Specialty toy store carrying a wide variety of products. Order by fax, phone, mail or email. Used and collectible board and card games. Based in Ohio, USA. Order only by phone, mail or email. Specializing in scale and competition rocketry kits and related materials. Order by mail or email. Amateur radio equipment including ferrites, baluns, tuners and converters. Order by phone, fax, mail, or email. Australian blues and jazz CDs. Audio samples, articles, and reviews. Order by email, fax, phone, or mail. Based in Australia. High power kits, parts, supplies, custom work. Order by phone, fax, mail, or email. PDF catalogs of CDs and cassettes numerous genres, DVDs, and VCDs. Order by email, fax, phone, or mail. Classical, popular, Broadway, movie theme, ragtime, and Christmas CDs, books, art, and collectibles. Order by phone, email, or mail. Large selection of mostly obscure jazz, especially avant-garde, and blues titles from hundreds of labels. Order by phone, fax, email, or mail. HO scale, turn of the century, smaller commercial, and industrial building kits that are authentically detailed for sale. Order by email, or mail. Small-label recordings of traditional folk music. Order by phone, email, or mail. Small-label recordings of traditional folk music. Requests welcome. Order by phone, email, or mail. Model engines for airplanes, boats and cars. Order by phone, email, or mail. Silver, porcelain, pottery, glassware, and accessories from many countries. Mail order, including overseas and shows. Email ordering available. Major credit cards accepted. Designs include cartoons, animals, florals, and oriental. Offers a membership to receive designs via email. Items include signed photos and documents, memorabilia, and arms. Order by email, mail, or phone. Stocks British and European model trains and accessories to supply the North American based modeller and collector with the latest releases. Order by email, fax, mail, or phone. Sale of dried apples, onions, tomatoes, oyster mushrooms, and sweet corn from northern Wisconsin. Mail or email ordering. Small but fully stocked military model shop in Hong Kong. Carries various kinds of after-market products from photo-etched to resin conversions. Order by mail, email, fax, or phone. If the business hours of Manatee Mailbox in may vary on holidays like Valentine’s Day, Washington’s Birthday, St. Patrick’s Day, Easter, Easter eve and Mother’s day. We display standard opening hours and price ranges in our profile site. 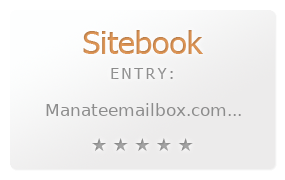 We recommend to check out manateemailbox.com for further information. You can also search for Alternatives for manateemailbox.com on our Review Site Sitebook.org All trademarks are the property of their respective owners. If we should delete this entry, please send us a short E-Mail.